Perfect for injuries incurred by spurs or armadillo bites. A Quickdraw cure for the cowgirl blues! No matter how leather-tough a cowgirl is, she's still going to get scrapes and cuts that require a bandage. These bodacious bandages won't cramp your style while telling the dogies to git along. 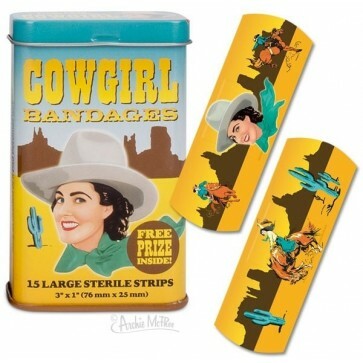 Fifteen large sterile strips inside a wild wild west themed metal tin.